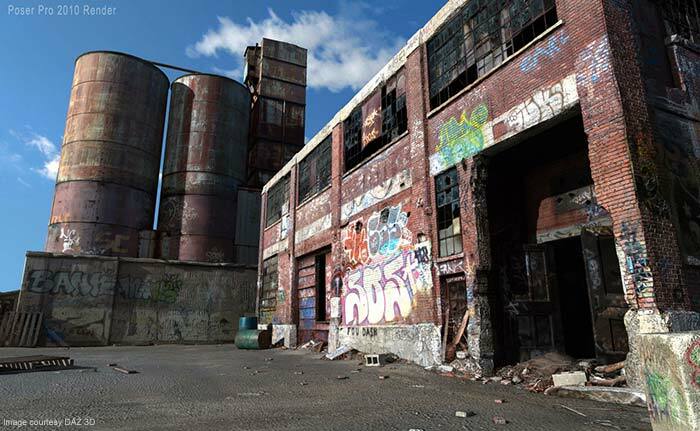 Aako’s Abandoned Factory for DAZ Studio / Poser is a great prop for urban scenes, skateboarding or your next hot female photoshoot. It’s a single prop created with the “old” Poser figure structure, so while it loads as a single item in your scene, you can still move / disable all individual parts, so it gives great variety in case you want to alter things and make it more personal. It does not feature any light set but has a skydome that can be used with DAZ Studio’s 3Delight render engine. The skydome will still work with DAZ Studio Iray render engine, but it may obstruct the real sky. The overall prop looks pretty good, although it lacks close up details. The building itself feels almost “scanned”, so at close range, there’s some “breakage” in some of the details. Other than that, a great prop from Aako. Get the prop from DAZ here.